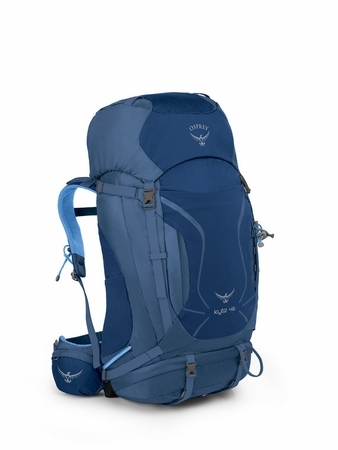 "The women's-specific Osprey Kyte 46 is a chameleon. With a separate zippered sleeping bag compartment and external sleeping pad straps, it's a fully functional overnight pack. Or cinch down the StraightJacket side compression straps and take it out for a day of climbing at the local crag. Whatever you put inside, Osprey's LightWire frame transfers the load to a comfortable spacer mesh harness and hipbelt. This innovative suspension system ensures all-day carrying comfort, especially in warm conditions when the Airscape mesh backpanel comes into play. When it comes time to unpack, the main compartment has top loading or side zip access providing multiple portals to get at your gear without struggle. Other storage features include a full-length vertical zippered side pocket, top-lid and under-lid zippered pockets, side and front stretch mesh pockets, and two zippered hipbelt pockets. Along with the extensive pocketry, there are dual front daisy chains and web attachment points on the top lid for anchoring gear to the exterior. Other useful features include an external hydration sleeve, tuck-away ice tool loops, and Osprey's Stow-on-the-Go trekking pole attachments. The entire pack can be shielded from the elements by deploying the integrated raincover. 2685 in3 / 44 L | 26h x 14w x 14d in. | 3.42 lbs "